New Horizons was still too far from Pluto (3.6 billion kilometers, or 2.2 billion miles) for LORRI to resolve any details on Pluto’s surface – that won’t happen until summer 2014, approximately one year before closest approach. For now the entire Pluto system remains a bright dot to the spacecraft’s telescopic camera, though LORRI is expected to start resolving Charon from Pluto – seeing them as separate objects – in summer 2010. During the October 2007 observations, Pluto was located in the constellation Serpens, in a region of the sky dense with background stars. “Using LORRI’s high-resolution mode allowed us to more easily pick out Pluto in a virtual sea of surrounding stars,” says New Horizons Project Scientist Hal Weaver of the Johns Hopkins University Applied Physics Laboratory (APL), which provided the LORRI instrument. Marking another first for New Horizons, LORRI also detected clear variations in Pluto’s brightness. Pluto rotates on its axis once every 6.4 days, allowing observers to see different portions of the planet’s surface (i.e., different longitudes). From ground-based and Hubble Space Telescope observations scientists have seen repeatable, well-defined differences in Pluto’s brightness they believe is caused by variations in frost cover over its surface. New Horizons will determine whether that is indeed the correct explanation when the spacecraft flies by Pluto in July 2015. “In the meantime, it’s gratifying to see that New Horizons itself now has the capability to track Pluto’s brightness variations over the next seven and a half years, and from a slightly different perspective than what we normally see from Earth,” Weaver says. This image demonstrates the first detection of Pluto using LORRI’s high-resolution mode, which provides a clear separation between Pluto and numerous nearby background stars. Typically, LORRI’s exposure time in hi-res mode is limited to approximately 0.1 seconds, but by using a special pointing mode that allowed an increase in the exposure time to 0.967 seconds, scientists were able to spot Pluto, which is approximately 15,000 times fainter than human eyes can detect. This montage shows the effects of using different resolutions and exposure times during LORRI observations of Pluto on October 6, 2007. The top left image was taken with LORRI in high-resolution mode using an exposure time of 0.967 seconds. The image to its right had the same exposure time but was taken in LORRI’s low-resolution mode with pixels that are four times larger, which makes the stars and Pluto look “fatter” and, therefore, less distinct. 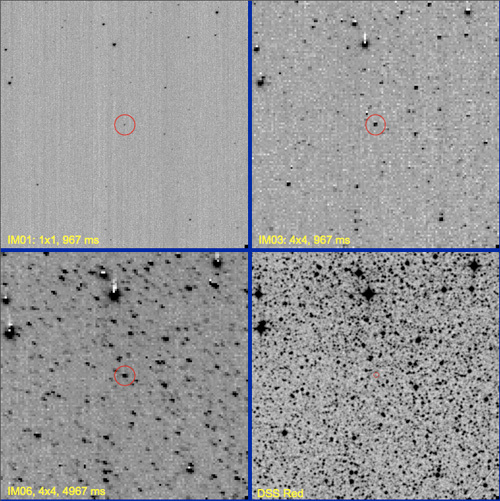 The image to the lower left is another LORRI image taken in low-resolution mode, but with an exposure time that is four seconds longer, which allows us to see “deeper” and pick up even fainter stars. (Pluto is clearly detected and is circled in each of these LORRI images.) The lower right image is a digitized photographic plate of the same portion of the sky taken in July 1986 by a large telescope in Australia for the Palomar Sky Survey. 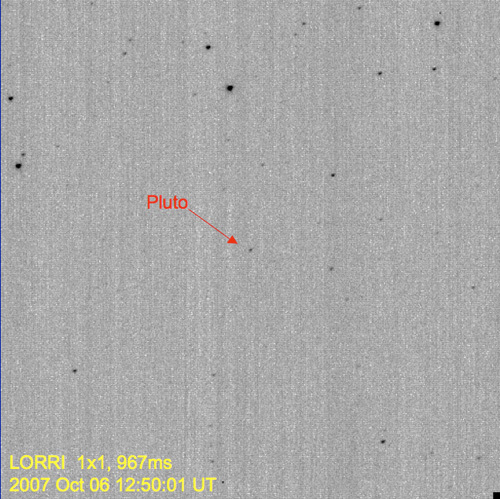 Pluto is not in this image, but Pluto’s location in the October 2007 observations is indicated by the small red circle. This image captures stars that are approximately 40 times fainter than can be seen in the lower left LORRI image and illustrates the richness of the background star field in this region of the sky.